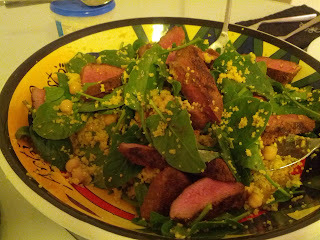 On the table within 15 minutes...lovely succulent lamb served on top of lemony couscous. Fantastic week day meal. stir briefly and cover. Leave for 5 minutes. Combine dried spices in a bowl along with salt & pepper and rub lamb loins in the mix so both sides are covered. Heat a frying pan on a medium heat, add a spray of oil and pan fry lamb for 2-3 minutes each side for medium-rare. Remove from heat and let lamb rest for 5 minutes, then slice thickly. 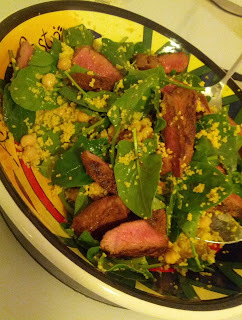 Grab a big platter and throw in the spinach leaves, chickpeas, pine nuts & mint. Add the lemon juice to the couscous and fluff up with a fork then mix it in with the platter ingredients. Drizzle some olive oil on top and season before adding the sliced lamb. Serve with the yoghurt with a squeeze of lemon juice. Enjoy!